A last minute call this afternoon to appear at the Westminster UNISON AGM being held at the prestigious ICA (Institute of Contemporary Arts) in central London, where I will be on a panel debating the cuts and representing COR (Coalition of Resistance). 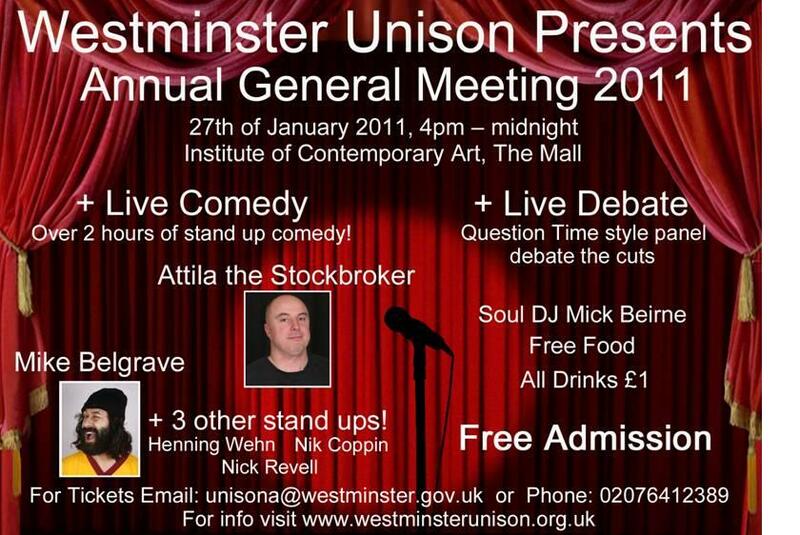 The discussion is to be preceded and followed by musical entertainment and stand up comedy with the likes of Attila the Stockbroker. Apparently other speakers will represent, Stop the War Coalition, the National Shop Stewards Network, and the Right to Work Campaign. Should be a stimulating debate. Hi! I really liked your blog. I have also a personal blog that you can find world news and my studies. You should visit and follow my blog. I am sure that you will like it.